In THE FIERY MENACE Doc finally notices Pearl Harbor happened. He’s out of town for the first couple of chapters, trying to convince the military to let him and his team enlist. The military: sorry, you’re more valuable on the home front. Given that it would be unthinkable for a heroic American not to enlist, I wonder if this is why the book’s been ignoring the US is at war — Lester Dent couldn’t think how to keep Doc out of uniform. The opening of this one is great. Betty Free, a stenographer, spots a body hanging in one of the chandeliers in the lobby of Doc’s skyscraper base (he’s on the 86th floor). We then get her mini-life story, which involves her vanishing from the story: she faints, screws up at her job later that day, gets fired, marries her boyfriend and then they settle down in a farming community. After the opening? Not so much. The original title was The Lost Vampire and the guy in the chandelier, it turns out spoke of hunting vampires. And it turns out he has a hole in him — only it’s not a bite mark, it’s a hole drilled in his forehead. So calling the killer a vampire makes no sense. Neither does seeing it: the vampire is more of a blazing human torch type (the hole in the forehead is made by a kind of super-blowtorch). It turns out the dead man hid a McGuffin in the chandelier that everyone wants. The vampire is the tool one side is using to scare the others into cooperation. The McGuffin is uninspired, a sizable horde of Nazi gold, but otherwise the war plays no role in the story. There’s also a curious statement that Doc tries to keep his 86th-floor base a secret, which makes no sense. Even if he shut down all references to it in the paper, it’s way too well established for it to become secret. Bobb Cotter argues the book reflects Dent’s efforts to make Doc more human, more fallible, less superhuman. In the past, when Doc has trouble with the cops, it’s promptly forgotten. Here, they’re still suspicious of Doc after the events of the previous book. Some newspaper articles, instead of gushing about Doc’s awesomeness, are critical and suspicious. I’m less convinced than Cotter this is an improvement, but it works here. The book as a whole, though, does not. THE LAUGH OF DEATH works great. We open on Doc at the Fortress of Solitude (Cotter says it’s the last time we see that secret laboratory) which just like Superman’s fortress would eventually be, is now disguised as an inhospitable ice island. Doc’s working unsuccessfully on a plastic insulated suit for the military (light yet cold resistant, but it cracks too easily), checks messages from his aides (and Pat, who’s assisting regularly due to the war effort) and learns they’re gone. For most of the book, Doc operates solo. His adversaries have an impressive weapon, a Joker-like laugh that fills everyone who hears it with pain and terror, and often makes them pass out. The gang wielding the laugh get their orders by vinyl recordings, a prototype of the Mission: Impossible tape-recorded instructions. This keeps the boss offstage, but it gives Doc an opportunity to set them against each other: he makes a recording telling one group that they’re fired, convincing them to turn on their boss. Doc is definitely more human. When he gets locked in a time vault and can’t get out, he has a fit of pique and smashes things in the vault in frustration. As in The Speaking Stone, Monk suddenly adds physics expertise to his repertoire so that he can provide the tech explanation for the laugh. I suppose it’s no more unreasonable than Johnny becoming an expert on plankton (same link). Overall, it’s an excellent yarn with an effective gimmick. #SFWApro. 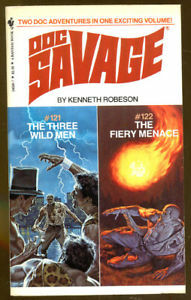 Covers by Bob Larkin, all rights remain with current holders.